(HONGSEONG=Yonhap News) Air Liquide, a French company will invest USD 10 million in Cheonan. 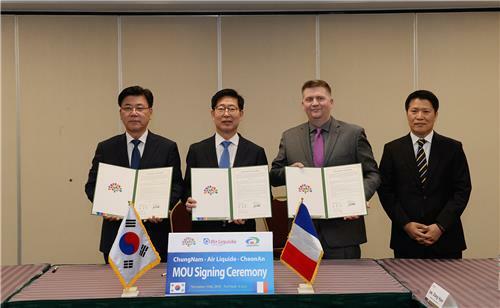 According to Chungnam-do on November 14, Yang Seung-jo, Governor of the Province, and Koo Man-seop, Deputy Mayor of Cheonan signed an MOU with John Fessenden, Director of the U.S. office of Air Liquide in New Jersey. The French group plans to build a new industrial gas production plan on a plot of more than 18,000 square meters in the Cheonan foreign investment zone, and start production from next year. Earlier this week, the U.S. chemical giant DowDuPont also signed an MOU to build semiconductor and display manufacturing facilities in the foreign investment zone and the industrial complex of the city. "Despite the unfavorable condition for attracting foreign investment against the backdrop of the trade war between the United States and China, we have been able to attract investments worth USD 110 million from two major global groups through the visit to the United States," said a provincial official.